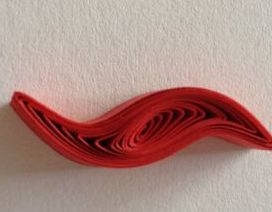 To learn the basic shapes you will need many scrap strips of quilling paper to practice with. How many and in what lengths is entirely up to you. 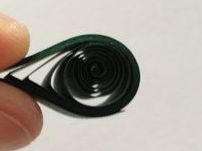 A slotted or needle quilling tool. A quick drying tacky variety is best. 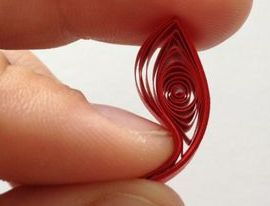 Quilling is an incredibly rewarding and pleasurable craft once you get the hang of it, so hang in there and keep on trying! 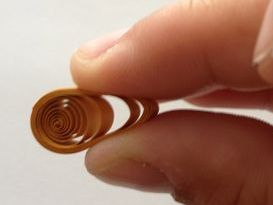 Insert the tip of your paper strip into the slot of your quilling tool (or wrap around the quilling needle) and wind tightly. Secure with glue before sliding the coil off. Begin as you did with the closed coil. 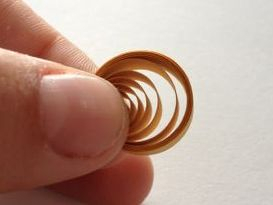 Slide the unglued coil from the tool and allow to gently open into circle shape. Glue end to secure. 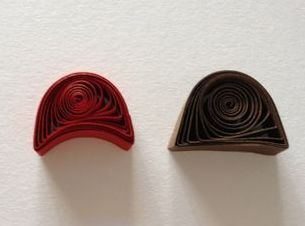 The open coil is the base shape for all the other shapes in this tutorial.You may wish to make a bunch and then further practice the remaining quilling shapes. Begin with an open coil. 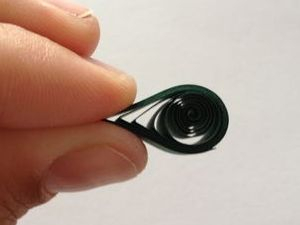 Pinch one side to create the tear drop shape. 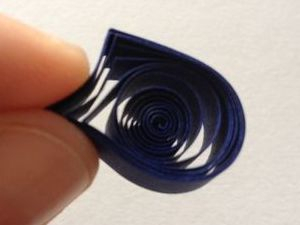 By different methods of bending, you can manipulate the tear drop shape into curved shapes. By bending slightly with your fingers, you can achieve a slight curve as pictured to the right. 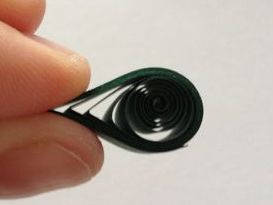 Wrap and press the tear drop around a pen to create a more closed curved tear drop shape. 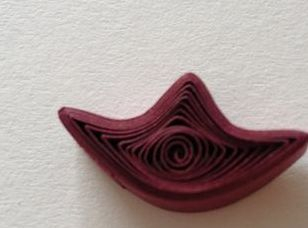 Roll the tip of your tear drop in towards the center to create a paisley. 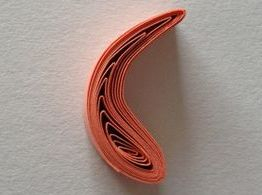 Squeeze both ends of an open coil to create a marquis shape. Play with where you put your finger pressure to create different centers. Begin by making a marquis. Curve each tip in opposite directions. Begin with the marquis. Push in one side with two fingers as shown, to make a point. Pinch off both rounded sides to a point. 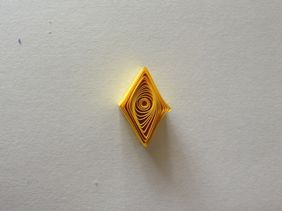 Open the diamond shape to reveal the square shape. You can also flaten the marquis. Pinch all four corners without pressing the center to get this effect. Shape to make square with marquis center. Small pressings made huge differences. Begin as you would for the square of your choosing. Press inward with a finger on each of the four sides. Play with the pressure to get different results. Turn slightly and pinch 2 new corners to create a rectangle. Make as you would a square, but leave in closed shape. Pinch off corners in random places. Begin with a tear drop. Move the center nearer to the point and then pinch off the bottom on the other side. 1/2 circle with rounded center. 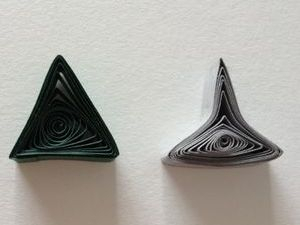 Press the shape around a pen or similar object to create a cresent shape. 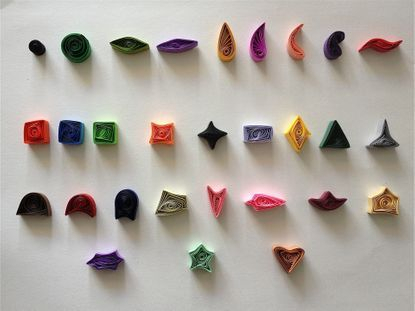 Begin again with the tear drop shape. Move to inside coil away from the point and pinch a second point to create the ghost shape. 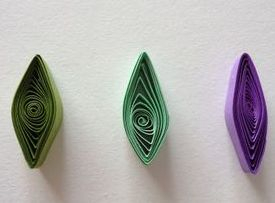 Make a tear drop shape. Pinch off the rounded top. Press in on the sides to make the shark fin shape. Pressing in the right spots can create a whole other look. Press in the round part with the tip of your tool. Use your fingers to smooth out the curve. Begin with a tear drop shape. 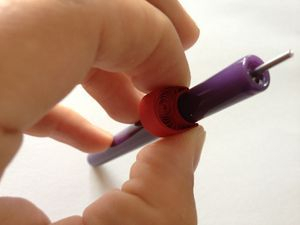 Press in the rounded part with the tip of your tool as shown. Turn the shape and pinch off two more points. Finish by pinching one more top point to create the house shape. Push in the centers to create different looks. 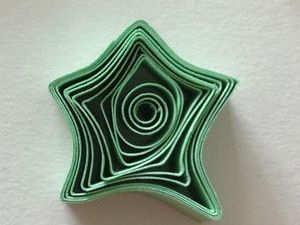 Pull out the points to create a star shape. While holding the pointed end, pinch the opposite end and without letting go - push in towards the original point. Pinch off the two newly created small points to create the arrowhead. Begin with making a marquis. Use tweezers to hold the center. Pinch off new small points on either sides of the two existing points. 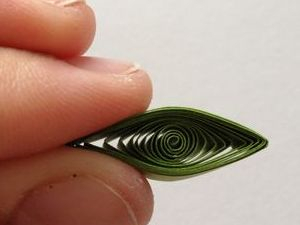 Make two last points by using your fingers to pinch the rounded sides to make the holly leaf. Practice makes perfect on this one. 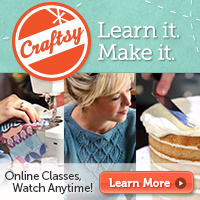 This tutorial was designed and created by Erin Curet of Little Circles. Copyright 2013. All rights reserved.